The history of watercolor paintings dates back to the paintings of Paleolithic Europe, when prehistoric humans used to paint cave walls with ochre and charcoal mixing it with other natural pigments to create visual representations of their surroundings. With the passage of time, the improvements in pigments, awareness of techniques and introduction of materials, such as papers, along with the formal introduction of watercolor with the Renaissance played a pivotal role in the evolution and growth of watercolor medium. From the 12th century, the use of watercolor started to fascinate artists and spread to Europe and until 15th century, European artists started contributing to the watercolor medium. They introduced and prepared their own watercolors for fresco wall paintings, Sistine Chapel is one of the most spell bound examples of the evolution and early use of watercolor, and German Northern Renaissance artists Albrecht Durer emerged as the earliest exponents of watercolor. From raw cave paintings to fresco wall paintings, the journey of the evolution of watercolor is tremendous and today it’s the most powerful medium in fine art. Watercolor medium grew on the canvases of the foremost and influential watercolorists like Vincent Van Gough, Albrecht Durer and Winslow Homer and so on. In Pakistan, watercolor masters like Hajra Mansoor, Sadequain, Syed Moazzam Ali, and Ali Abbas Syed are among the artists who have raised the standard of watercolor medium by introducing new techniques and producing masterpieces since a decade. 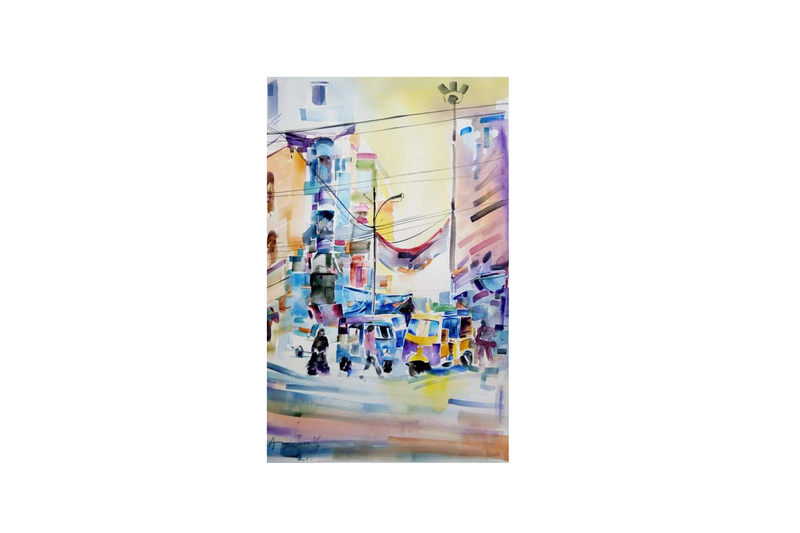 To promote watercolor medium all over the world, International Watercolor Society (IWS) is playing an active role and conducting workshops, arranging International Watercolor Biennales and exhibitions in more than 80 member countries of IWS including Pakistan. There has been number of small and big exhibitions held in Pakistan in collaboration with IWS in which many eminent artists from member countries had participated. The latest addition in the series of exhibitions by IWS , ‘Light and Shade’, displayed an array of watercolor paintings of nine member artists from different cities along with live watercolor demonstration conducted by two of the participating artists, Muhammad Zahid and Shaima Umer. The exhibition held at Art Citi Gallery in Karachi and arranged by the City Coordinator of IWS, Sharjil Baloch. The participating artists were Amir Jamil, Farrukh Naseem, Ishfaque Ali and Shahjehan Ahmed from Karachi, Imran Khan from Peshawar, Shaima Umar from Lahore and Muhammad Zahid from Gujrat. Each artist displayed 4-6 watercolor paintings depicting their surroundings, common life and nature with an extraordinary understanding of colors, context and textures. Amir Jamil depicted cityscapes in rich details. The use of bright hues, mainly sea and sky tones, created a soft image of a city life. 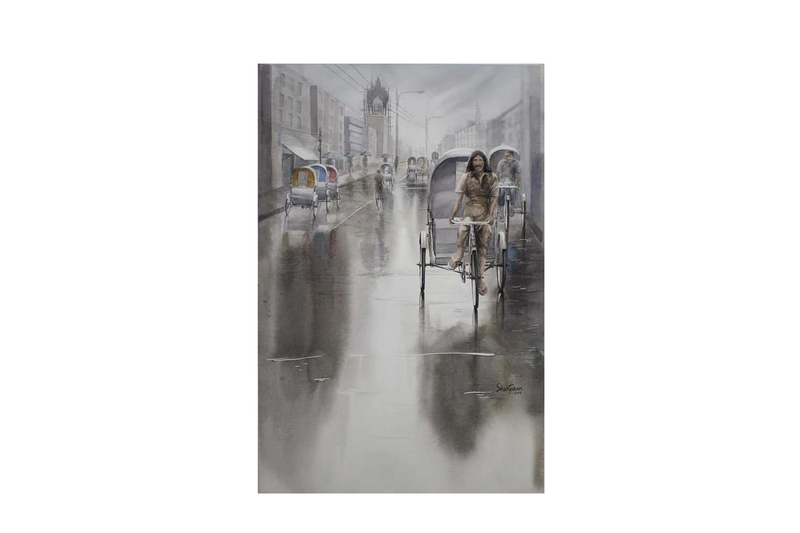 The nimble and careful strokes defined the ability of Jamil to express an insight into the city life. Farrukh Naseem’s interest also lied in ever evolving cityscapes. He resides in the commercialized area of Karachi and the glimpses of a busy city life could be observed in his work. Naseem’s focus seemed to be the buildings and architecture. He brilliantly played with light and shadows to create dark and bright impacts with a composition of dark colors that brought out the beauty of the city life. 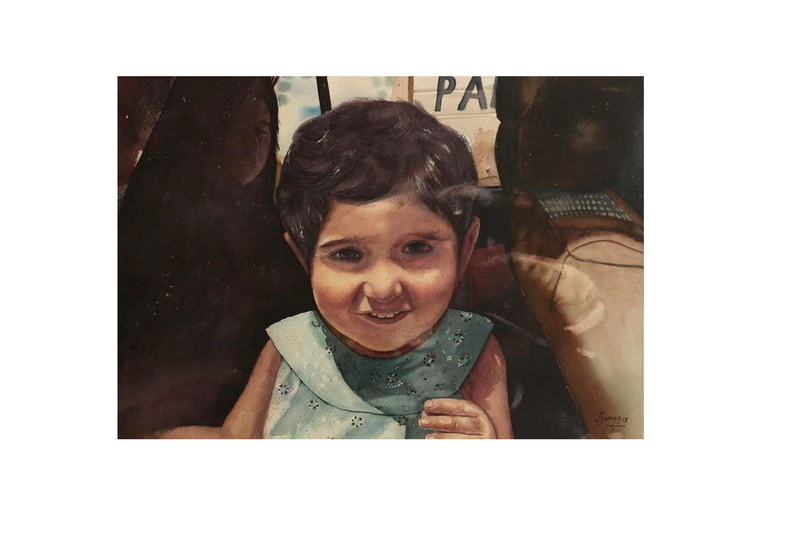 Fascinated with colors and paintings since childhood, Imran Khan showed the beauty of human faces through watercolor portraits. He observed the beauty of faces and replicated them on the canvas. The classic application of colors and technical blending on the paper made the portraits more expressive and raised the intensity of detailing. In one of his pieces, he painted few boats surrounded with snowy mountains. Khan kept most of the parts in whitish tones, and bluish tones were used to free the scene from agitation and disturbance. The darker tones were used to highlight the first few boats in the sea whereas the rest of the scene was fading away in the fog, created with lighter colors, was soothing to the eyes. 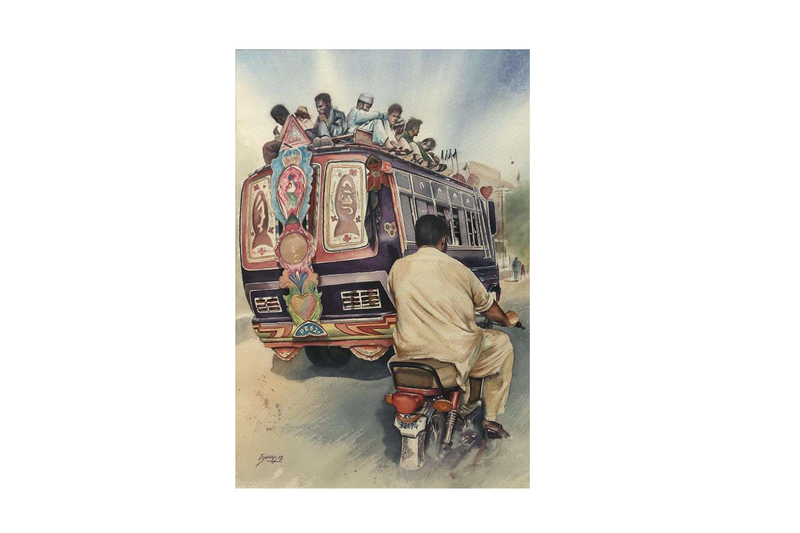 Ishfaque Ali had chosen to paint the daily routine life of a common man. He believed that the fast moving life has a lot to cherish and an artist can never run out of options if human life is his/her subject. 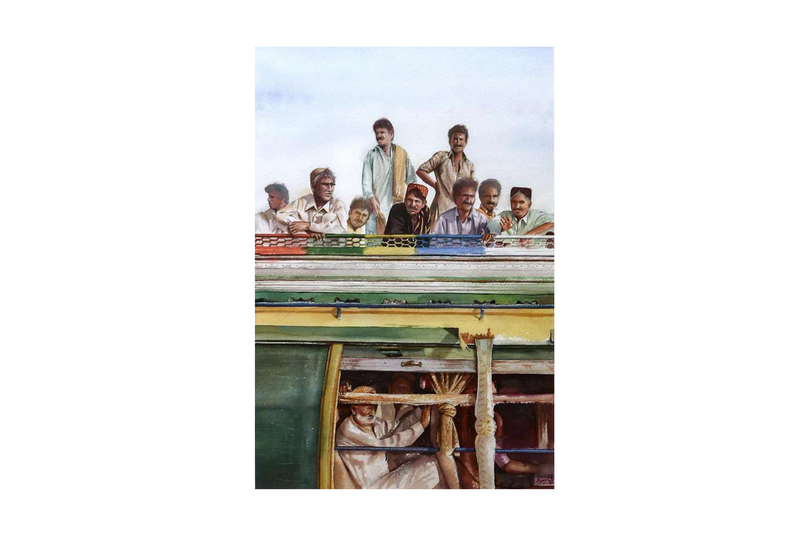 He painted multiple subjects with personal approach which is also relevant to Pakistan’s culture; a rustic abandoned bus parked at the back of a building, a local bus heavily loaded with a bunch of people sitting and standing on the roof of the bus and a face of a smiling child. Ali preserved these glimpses from everyday life which are ordinary to a lot of people thus overlooked. “The challenge, as with every recreated moment is to not caricature the moment and instead capture it in its original glory.” He stated. Shahjahan Ahmed presented an array of artworks that depicted a tale of his journey to different countries. He had painted famous painting series ‘gondola in Venice’ through which he shared his memories of being in Venice. In other two paintings, Ahmed had used slightly black and white hues that developed into a greyish tone that helped him exaggerate the image. In one of these paintings, he sketched a rainy scene where light and shadowing dominated the painting. Whereas the other painting showed boats parked on a sea shore in which he highlighted the main image with equal toner contrast, blending the background with whitish colors to create a fading effect. Mujeeb Lakho is one of the most talented emerging artists today. Lakho has a brilliant command over pen and ink drawings. His extraordinary details to the expressions in the faces he drew were a delight to look at. Each alluring portrait depicted a different mood which was powerful and easy to understand. These faces were simple yet sharp in their own unique style that is a challenge for an artist to maintain. The clean lines brought out the real expression of the faces he drew, but also created complexity due to high contrast at some points. 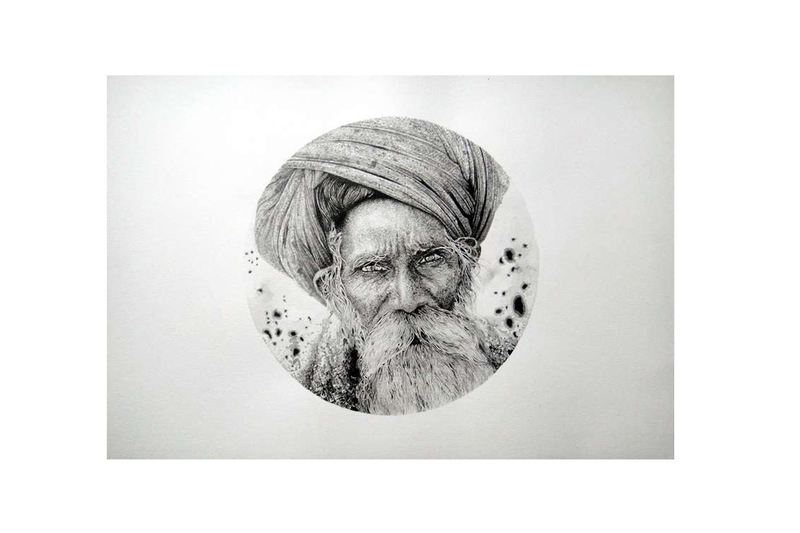 Lakho’s pen and ink drawings on paper are monochromatic, but not monotonous which is where an artist wins with his expertise of producing minimum yet powerful work. 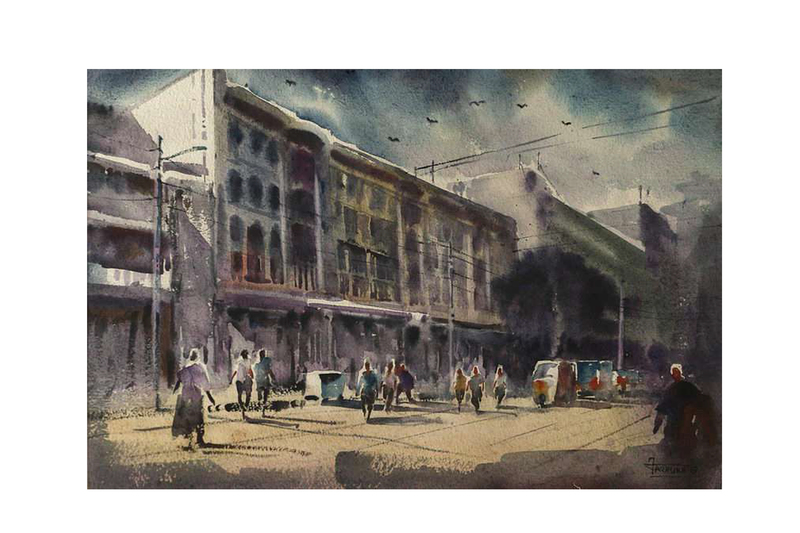 Sharjil Balcoh, a doctor turned artist and a coordinator of IWS for Karachi, showed a completely different side of watercolor which was contemporary to some extent. He closely observes and studies the watercolorist from around the world to learn and bring new techniques in watercolor. “I denounce the conventional way of doing watercolor paintings; practicing the same style again and again, making paintings from references, landscapes, cityscapes, it brings monotony in the medium. I wanted to take watercolor medium to the contemporary side to open new horizons for the next generation.” He stated. 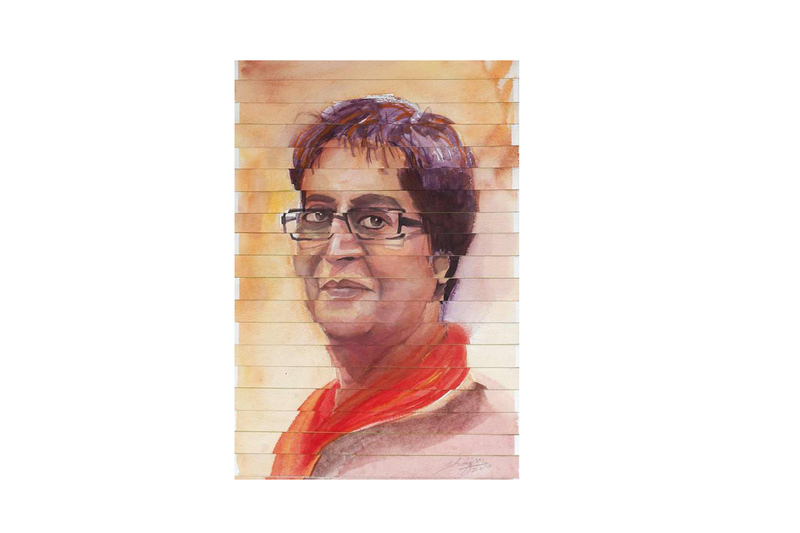 Along with other collages, Baloch remembered Sabeen Mehmood and acknowledged her serves to humanity by painting her portrait in a collage form. Baloch said that the procedure of creating these collages were interesting and peaceful for me. I wanted to convince people in the art world that watercolor medium is vast and has a lot of options; we just need some artists to think out of the box like he has done. 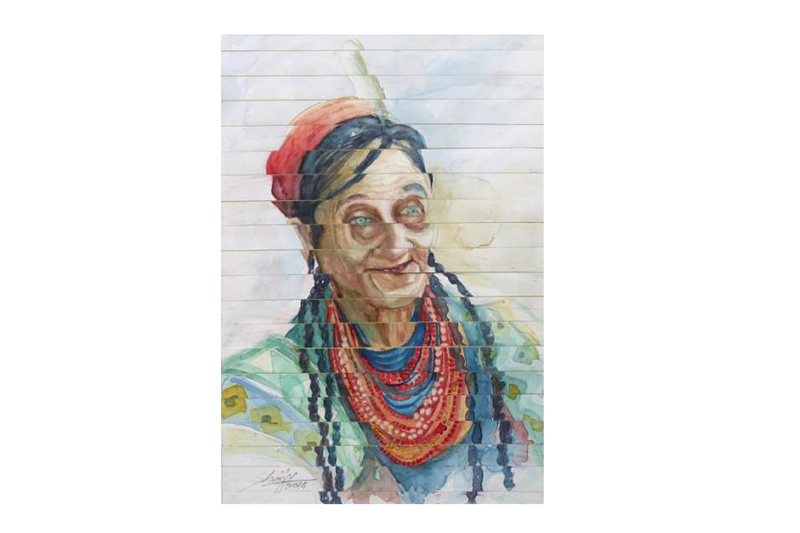 Besides these spectacular watercolor paintings and pen and ink drawings, Art Citi had arranged two live demonstrations of Shaima Umer and Mohammad Zahid. This live demonstration is a signature of IWS which is might be of an hour but it plays a role of a mini art academy where artists can learn and watch the masters spreading the magic of watercolors. Shaima Umer always liked to relate herself with the nature and surroundings. 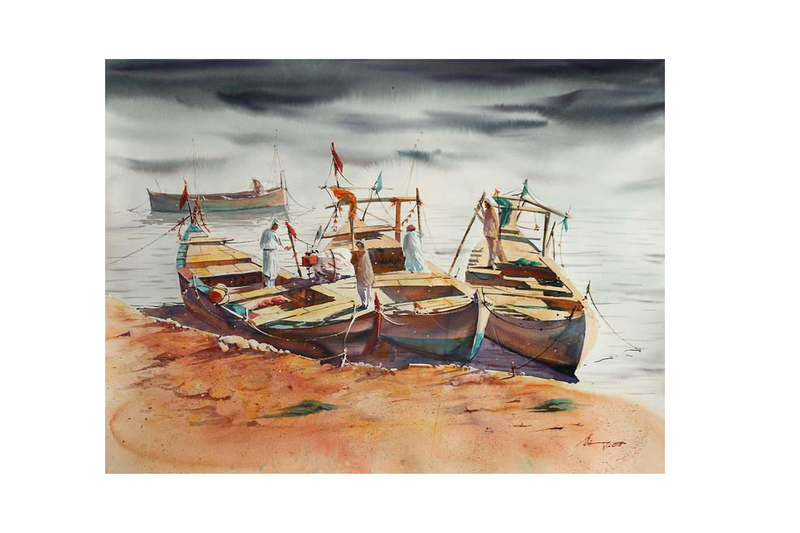 The subject she chose to paint live and display at the gallery revolved around the boats of Pakistan and life of people who live near the sea shore. 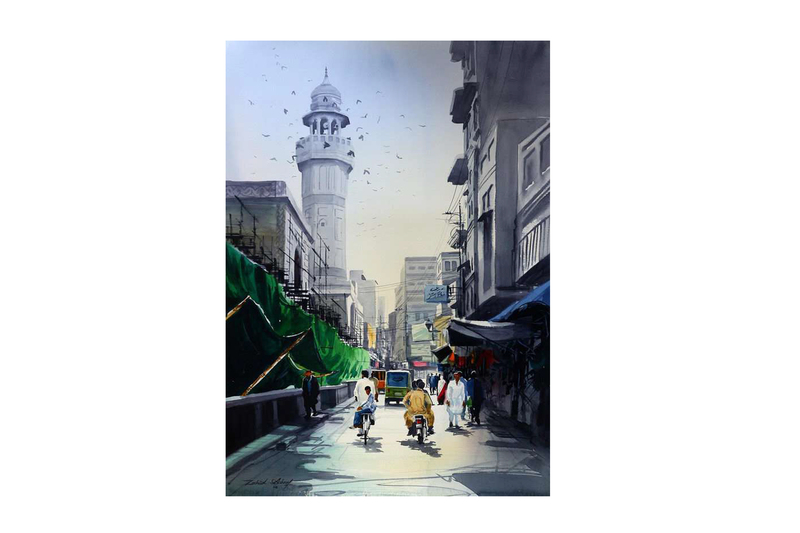 “My paintings are the syndicate product of nature, perception and imagination and I like to capture the beautiful landscapes, old building s and heritage of Lahore.” She shared. Umer tried to show her teaching skills and communicated with the audience through her live demonstration which was, near to her, a great chance to show the techniques and depth in the watercolor medium on the platform which was provided to the artists by IWS. 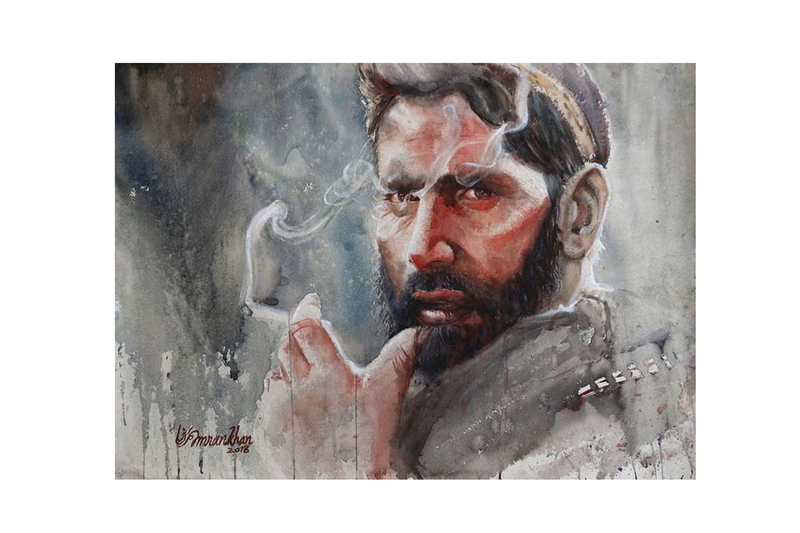 Mohammad Zahid has been practicing watercolor medium since a long time and has mastered techniques which could be seen in his live demonstration. He focused on covering the walled city in his paintings and had maintained a series on the same subject. IWS is playing a pivotal role in strengthening the watercolor medium, striving hard for delivering the importance of this distinguished medium to the world and assembling talented artists from around the world to join their team and make a healthy future of watercolor medium. 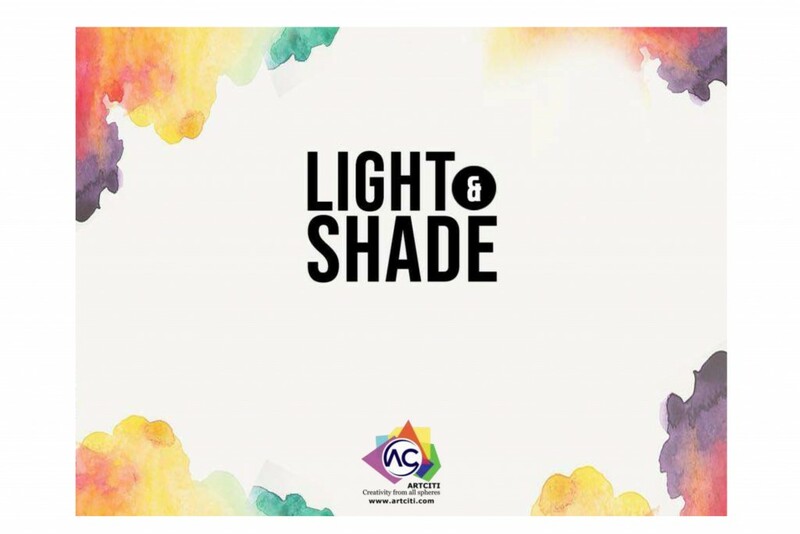 ‘Lights and Shades’ was held at Art Citi in Karachi from October 11th to October 13th and is covered in the November issue of Art Now Pakistan.